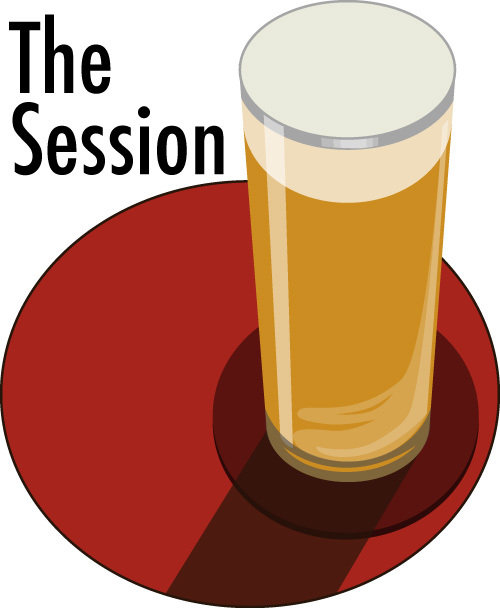 This is my contribution to The Session 129, aka Beer Blogging Friday. As someone who lives in Berlin, I would call myself rather privileged when it comes to beer diversity: there is a vibrant craft beer scene, including a number of microbreweries, places dedicated to specifically German or Belgian beer culture, and generally a great availability of everything. Except for one thing: cask ale. One of my great pleasures in beer is cask ale, that is fresh beer, usually top-fermented and of a British style, conditioned with live yeast in small casks, and served directly from it or via a beer engine. When done right, this is probably the best beer you can have, and you can have more than one of it. Now, if I said that there was no cask ale in Berlin, I’d be lying, because there is in fact one pub called Loch Ness, a pub run by two Germans who are rather… enthusiastic about Scotland, including the beer culture, and so cask ale is usually available which they import themselves once every few weeks. Once a year, they even do a Real Ale Festival. The only problem is: it’s rather far away. From where I live, it is surprisingly hard to reach, we’re easily talking about an hour. Ironically, Försters Feine Biere is only about 30 minutes away by foot, but for me to get there, it takes me about 30 minutes as well, so it works out the same in the end. This difference is owed to the layout of public transport in Berlin: while Försters is close to an U-Bahn line which runs close to mine, Loch Ness is close to an S-Bahn line which is rather out of the way and would require me to travel to Brandenburg gate. But then, that’s not even the point. I don’t want one pub that serves cask ale, I want several. I don’t want outrageous beers in them, but rather easy-drinkable beers that are just well done, think of beers like Landlord, Harvey’s Best, London Pride, Old Peculier, or for when I want a hoppier beer, something like Jaipur. I’m not saying I want exactly these beers (I certainly wouldn’t mind them, though), but rather something like it, possibly and preferably even locally brewed. My other interest in beer, besides drinking it, is the history of beer. One truly local beer style that I miss in Berlin is Berliner Braunbier. You’ve probably never even heard of it. Berliner Braunbier is the other local top-fermented beer style in Berlin besides Berliner Weisse. Unlike Weisse, the Braunbier was a proper brown beer, made from a very dark kilned malt, and was not sour (or if sour, only very little). But just like Berliner Weisse, it was put in casks while it was still fermenting and sent to the local pubs and inns, where it finished fermenting. Also like Berliner Weisse, it was diluted before it was served or bottled. Berliner Braunbier existed in two variations: one was a rather sweet version, barely hopped, while the other was strongly hopped, a so-called Bitterbier. Already in the 19th century, some beer writers argue that Berliner Braunbier are actually two distinct types of beer because of the vast differences in the different Braunbiere that were served in Berlin. The Braunbier itself was brewed from a high-dried malt, some sources even claim it was four-row barley malt. Because of relatively simple smoke kilns at that time, the malt was smokey, but the malt was left to mature for several months in order to lose some of that smokiness. The resulting beer was described as very dark, and hopped differently, at rates ranging from 1.4 g/l to 11 g/l. Again, already in the 19th century, some literature notes that for efficiency and flavour reasons, roasted malt together with a paler malt could be used instead of producing a dark malt. Does that ring a bell? It sounds similar to English Porter used to be brewed: first it was formulated as 100% diastatic brown malt, and only later the amount of brown malt was reduced in favour of pale malt and black malt. In some ways, that makes Berliner Braunbier a kind of local convergent evolution that shares several similarities to Porter, but is historically unrelated to it. How can we be sure that it is unrelated? Because Germans knew and liked Porter, and when German brewers produced something like a Porter, they would call it a Porter, even going so far as making their own German Porter beer style (which is a whole topic on its own). Funny side story: in February or March this year, I attended a talk by Joe Stange about German and American brewing and the mutual influences, hosted at Vagabund Brauerei. In a discussion, one of the brewery owners noted that Berlin’s water is relatively hard and quite suitable for brewing dark beers, so he wondered why there’s no local dark beer style. Haha, there actually was! It’s just been completely forgotten about, and like many top-fermented beer styles that were popular in Northern Germany, died out when pale Lager beers became popular and revolutionized the beer market. Any German noble hop variety, with a hopping rate of e.g. 1.4 g/l, 4.4 g/l or 11 g/l. Dough in malt with hot water into a very thick mash at 61 °C, then rest for 30 minutes. Add boiling water while stirring to raise temperature to 76 °C, then rest 120 minutes. When lautering, add another 9 liters of boiling water. Boil for 90 minutes, add all hops at the beginning of the boil. Ferment with a top-fermenting yeast strain at 23 °C. This is my contribution to session 125, aka “Beer Blogging Friday”. In this session, I’m writing about my views about SMaSH beers. SMaSH beers are a way of formulating beer recipes. SMaSH stands for “single malt and single hop”, meaning that in the formulation of the recipe only a single type of malt (usually a base malt of some sorts) of a single hop variety are being used. Everything else, from yeast to mashing regime to hop dosages and timing, is up to the brewer. Would I consider SMaSH beers to be trendy? No, not at all. The only reason that I can see in purposefully producing a SMaSH is to try out a specific ingredient, be it a specific base malt, a new hop variety, or even a new yeast strain on top of a simple, neutral SMaSH wort. While certainly a great tool for homebrewers for learning to know ingredients, I personally find them boring and uninspired. In particular when commercial brewers produce them: it reeks of beer geekery, it will not impress people with no interest in the finer details of brewing, and more often than not, the resulting beer is unbalanced. Don’t get me wrong: there are beers and whole styles that happen to be SMaSH beers, but they were not conceived with the specific idea of producing a beer to highlight one type of malt and one hop. From a purely historic point of view, most beers were probably SMaSH beers: the maltster made one type of malt, the brewer took that one malt and used the local hops he always used for brewing, and made beer out of that. Modern base malt names like Pilsner malt, Vienna malt, and Munich malt show this historic connection with classic styles. Of course, there are many ways to formulate recipes for styles like Bohemian-style pale lager, Vienna lager, Munich Helles or Munich Dunkles. But for each of these classic lager styles, there is a straightforward way that happens to be SMaSH. For a Bohemian-style pale lager, like a Pilsner, you can just use 100 % Pilsner malt to an OG that is suitable for the strength you want to achieve, hop it with large doses of a hop variety like Saaz for both bitterness and aroma, and ferment with a lager yeast. Vienna lager? Similar: 100 % Vienna malt, bittering with a classic hop like a Bavarian noble hop variety or Saaz, ferment with a lager yeast. And the same goes for the Munich beer styles: depending on whether you want it pale or dark (Helles or Dunkles), choose a pale or dark base malt, hop with some Bavarian noble hop for only a restrained bitterness, and ferment with a lager yeast. Of course, this goes beyond classic lager styles: beers like pale ales, IPAs, golden ales, bitters, or saisons could easily be formulated with just a single base malt and just one hop variety. Even a relatively unknown style, Grätzer/Piwo Grodziskie, was/is usually brewed with a single malt: oak-smoked wheat malt. There are probably plenty of many more examples. Other beer styles can practically not be achieved as a SMaSH, in particular those who require more than one type of grain: just think Bavarian wheat beer, which needs to be brewed with more than 50 % wheat malt, but usually also contains a certain share of barley malt. Dre Beechum suggested an interesting extension to SMaSH, “brewing on the ones“, that only slightly widens the constraints of SMaSH, but allows for more existing styles to be formulated easily. I wrote about this in the context of designing simple beer recipes a few years ago. But still, I’m convinced that SMaSH or “brewing on the ones” beers should not be done just for the sake of strictly keeping to this scheme of recipe formulation, but rather as a rough guideline to formulate simple recipes in order to brew excellent beers. After all, the resulting beer is what counts to the connoisseur, not the (by itself meaningless) notion that only one hop and only one malt type were used. If a beer can be improved by adding a single specialty malt, or by using different bittering hops than aroma hops, then you should totally do that, instead of insisting on conceptual purity. Because what counts in the end is that the beer is good. There is one beer style that seems to be the goal of many homebrewers to get it right: Munich Helles. A pale, golden lager beer with a malty body and not much hop character. Many have tried getting it right. There are threads on homebrewing forums, even on German ones, Reddit also has something, there’s a even a blog dedicated to brewing lager beers with the focus on Bavarian beers, aptly named “The Quest For Edelstoff“, the almost legendary export-strength Helles brewed by Augustiner. Since my wife and I particularly enjoy Helles, it has been my goal in the last few years to brew a really good one. In February, I brewed my fourth one, and so far, it’s been absolutely fantastic (it’s still carbonating, though). In the fourth try, I got everything just right, it looks right, it smells right, it tastes right. There is nothing where I would say that this is a fault (no matter how minor) in the beer, and I am overly critical about my own beer. Maybe I should discuss what my previous attempts looked like. In the first recipe that I did in February 2014, the grist was rather complex (mostly Pilsner, some light Munich malt, some CaraPils, some Melanoidin). The mash was a Hochkurz infusion mash, 90 minute boil, with a single hop addition of Hallertauer Mittelfrüh. W-34/70 yeast. If I remember correctly, the beer came out a tad too dark (still pale, but more brown than golden), and it had a honey-like note. I blame the melanoidin malt for that. The second attempt, in October 2014, was close to the first recipe, except no melanoidin malt, and Perle hops at 90 minutes and 15 minutes. The mash was unexpectedly more efficient than planned, and in the end the yeast must have stalled a bit, so it came out strong, more like a Maibock, with some residual sweetness. The third attempt, brewed in September 2015, was 100% Pilsner malt, with a Hochkurz double decoction. This time a 2 hour boil, and Perle at 60 and 40 min, and Hallertauer Mittelfrüh at 15 min. Yeast (again) was W-34/70. The overall result was very cloudy, and had more hop aroma than anticipated. It tasted more like unfiltered Staropramen than a Helles. For the fourth attempt, done in February 2016, I decided to do a few things differently, and incorporated a lot of recommendations from Ludwig Narziß’s books. I composed the grist of 98% Pilsner malt and 2% CaraHell, which I then mashed at 38 °C in a water adjusted to a residual alkalinity of 0 °dH. I rested for 20 minutes, then heated up to 50 °C. I then drew a decoction, heated the decoction up to 65 °C, rested until conversion, then brought it to a boil for 10 minutes and poured it back to bring the mash up to 65 °C. I then let it rest for 50 minutes. I then drew a second decoction, again brought it to a boil for 10 minutes, and poured it back to get to 75 °C. I then lautered and sparged. Again, a 90 minute boil. For hopping, I used Hersbrucker hops this time, with additions at 70 and 40 minutes. Also, I cheated, and added some Irish moss at 15 minutes. After chilling the wort to 11 °C, I pitched a large starter of Wyeast 2308 (i.e. the Weihenstephan 308 yeast strain), and let it ferment for 2 weeks, followed by 7 weeks of lagering at 1 °C. I then kegged it. It’s currently carbonating. Since the overall amount in the fermenter was about 21 liters, but the keg only fit 19 liters, I got to try some uncarbonated Helles. The colour was clearly golden, and just right. The hops were subdued, and the beer was dominated by a very soft malty note. There was no sweetness though. The mouthfeel was very full-bodied, and there was a typical lager flavour in there – I guess low levels of sulphur. All in all, a very pleasant experience. For the colour, I’d say it’s most definitely the grist that’s responsible for that. 100% Pilsner malt was a tiny bit too pale, small amount of Munich and/or Melanoidin malt made the beer a tiny bit too brown. 2% CaraHell really seems to do the trick. Then the hops: Perle clearly doesn’t work so well, Hallertauer seemed okay in the past, but the Hersbrucker seems to taste even nicer when used in rather small amounts and with no late additions. And last, probably one of the most important factors, the yeast. While W-34/70 is one of the standard strains in lager brewing, I’m not sure it’s particularly well-suited for brewing Helles. Even when fermented cleanly, it just seems a bit harsher than the W-308 strain, which is just softer and a bit less attenuative. I’m not sure whether the decoction mash made any real difference, but it’s certainly a technique to achieve a highly fermentable wort. I’m not saying my Helles is the perfect Helles, but of those that I’ve brewed so far, it is by far the best. For the next attempts, I will definitely keep the grist, and most likely the hops, and at most will I experiment with other mash schedules and methods, and most likely with other Bavarian lager yeast strains that are not W-34/70. W-206 is certainly worth a try, and so is W-109 which is a traditional strain for Helles and available for homebrewers. After my research of Horner Bier, I took more interest in trying to reconstruct other historic beers. In “Vollständige Braukunde” by Johann Carl Leuchs, I stumbled upon Mannheimer Braunbier, which is, as the name says, a brown beer that used to be brewed in Mannheim. The typical brewing process for the beer is the Rhine method which was common around Mannheim, Frankfurt and Strasbourg. The malt is doughed in by underletting a mix of boiling and cold water. The water to grain ratio is relatively low, while the initial mash temperature is 30 to 50 °C, depending on the brewer. Then boiling water is added, until stirring is easier, and the mash is constantly stirred for 45 minutes. Then wort is drawn off and poured back onto the mash until the wort is clear. When all wort is drawn off into a cooling tub, more boiling water is added to the mash, a rest of 30 minutes is done, and the second runnings are drawn off into the cooling tub. At that point, the grains are considered to be completely spent, and no small beer is made from them. During the second mash, a bit of wort is taken, the hops are added, and are boiled for 15 minutes. This is called “roasting”. After that’s done, the remaining wort is added from the cooling tub. In the cooling tub, any unclear material like flour shall remain back to make sure a clear wort is boiled. Total boil time is 3 to 4 hours, then the wort is cooled down to about 18 °C, and yeast is pitched. Leuchs mentions two recipes, one brewed with brown barley malt, amber barley malt and sugar, the other one brewed with equal amounts of brown barley malt and amber barley malt, juniper berries, and ginger. For the latter recipe, Leuchs refers to Hermbstädt, the author of the book “Chemische Grundsätze der Kunst, Bier zu brauen“. 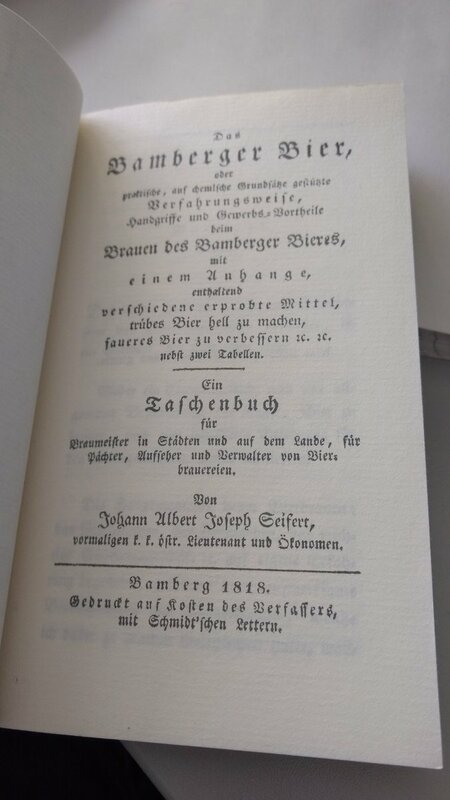 Interestingly, Hermbstädt mentions that originally, Mannheimer Bier was indeed brewed in Mannheim, but in 1826 (the year that book was published), was brewed in Berlin, where it was enjoyed as a common, healthy, and nourishing drink. It is described as very clear. Interestingly, Hermbstädt describes a different mash schedule than Leuchs: in total, 12000 quarts (1 quart is about 1.145 liters) were supposed to be used for mashing to produce just 2000 quarts of beer, with a boil of only 30 minutes. I don’t know how that should work, so I simply don’t believe it. Also the hopping is different: hops and juniper berries are infused in water twice, and that infusion is then added to the boiled wort. When the cool wort is added to the fermentation vessel, chopped up ginger is added along with the yeast. According to Hermbstädt, the beer was drinkable already 8 days after brew day. Based on this information, I tried to come up with an interpretation of the beer style. I’d leave out any excessive boiling, but I’d keep essential elements like the mash schedule as described by Leuchs, and the distinct technique of hop roasting. As brown and amber barley malt, I’m simply picking Munich malt and Vienna malt. This may not be the truest representation, but it’s the closest what we can get in modern diastatic malts that roughly matches the colour description. The question of how smokey the malts for this beer originally were is not something I’m able to answer, nor am I willing to do a wild guess and produce a smokey beer. As hops, I’m picking Tettnanger as that would be a relatively local hop variety for Mannheim. The day before brewing, smash up the juniper berries and soak them in a liter of water until the next day, then remove them. Dough in the malt with 10 liters of water to result in a mash at 50 °C. Keep that temperature for 30 minutes, then add another 10 liters of hot water to result in a mash temperature of 68 °C. If that’s too much effort, just add 10 liters of water of at least 50 °C, then heat up to that temperature. Then do a Vorlauf until the wort is clear, and lauter. Sparge with hot water. Take the first few liters of the first runnings, and bring them to a boil together with the hops, and boil for 15 minutes. Then mix that with the remaining runnings and boil for 90 minutes. At the end of the boil, add the juniper berry infusion, and chill the wort to about 20 °C. Add chopped up ginger to the wort, and pitch an ale yeast. Depending on your brew kit’s efficiency, the resulting beer should come out with about 13.5 °P, 80 IBU and 5.5 % ABV. The bitterness is obviously crazy high, but with some aging, it should subside and smooth out. As for brewing that, I have no immediate plans to do so. I’m currently planning to brew a Berliner Märzen-Weisse inspired by a historic recipe, about which I will post here soon. If you’re brewing Mannheimer Braunbier though, I’d love to hear about any results. About two years ago, my then girlfriend and I brewed our first Christmas beer. It was an oatmeal milk stout which, in retrospect, had just too many components and was a bit confused, but still drinkable. Right after finishing that, we had another great idea: why not brew a big beer that takes some time for aging, and serve that as Christmas beer in a year’s time? So the obvious style for us was English barleywine. I put together a recipe, we brewed it (and had a very chaotic brew day with too many stuck sparges and very low efficiency), bottled it, and after a year, it came out really nice. We kept a few bottles, and yesterday, we brought some of them to the Christmas beer tasting of the Berlin Homebrewing group. This beer, now two years old, was well-received, and so I’m documenting the recipe for others to brew it and have the patience of a year or longer to actually get a great beer. Two hour mash at 62 °C, then a 90 minute boil. Nottingham Ale yeast. OG was 22 °P, FG was 3.5 °P. 9.6% ABV. 65 IBU (calculated). In my notes, I forgot to write down the alpha acid content of the hops that I used. In the end, it doesn’t really matter much, because the hop bitterness almost totally fades, and there is just some very muted, round bitterness there that accentuates the overall maltiness. Because of that, I’m not sure whether anything but a bittering addition really makes sense in the end. After fermentation, we bottled the beer without any priming whatsoever, and no fresh yeast. It still took up some carbonation, which probably comes from tiny amounts of fermentable sugar left after the main fermentation, which was eventually, and very slowly eaten up by the yeast. After that, we sampled the beer at 3 months, 6 months, and 9 months age. Only at 9 months age, it started to taste nice, but really only reached its full potential after 12 months of bottle maturation. An additional 12 months added even more complexity, and that makes me very happy about this beer and the recipe.